Say goodbye to boring corporate gift baskets and hello to a delectable experience your business associates, clients, and employees won't ever forget. There's nothing like the taste of a real southern praline or the lush chocolate and decadent caramel of a bear claw from River Street Sweets. Savannah's original candy store, River Street Sweets is home to unique, handmade southern candies crafted in small batches for the best quality and taste. 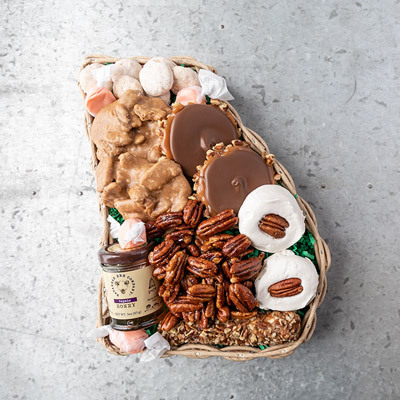 Handmade candies from River Street Sweets are always something special and always impressive, especially when presented in one of our gift baskets, boxes, or tins. 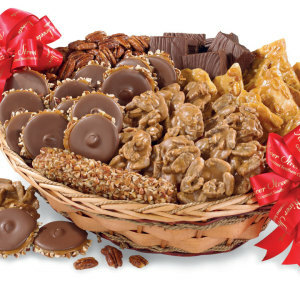 Select business gift baskets filled with our world famous pralines, glazed pecans, chocolate bear claws, or other original candies. Some folks may call them "turtles", but here at River Street Sweets, we call them bear claws. Bear claws, which have been featured on Rachel Ray's Snack of the Day, combine our buttery caramel with pecans and milk, white, or dark chocolate. 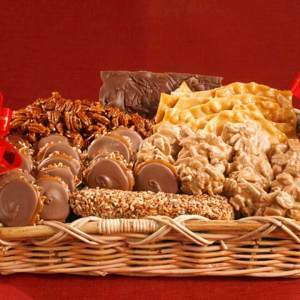 You can find bear claws in our Tin of Assorted Favorites, our Gift Box Assortments, as part of a Gift Tower of sweets, and in our Mega Grab Basket which is ideal for any office holiday party — it serves 25! When ordering business gift baskets from River Street Sweets, one of our dedicated gift specialists will help you to choose the perfect treats for any occasion, from Christmas to your firm's 10-year anniversary or office holiday party. Need something special to thank a client? Consider one of our many sizes of Gift Tins including the Glazed Pecan Tin or our popular Nutty Favorites tin that has a variety of nuts including pistachios, roasted cashews, chocolate almonds and more. We'll help you make it personal by enclosing your business card and individual message with each gift. You can personalize any business gift from River Street Sweets with a free logo card. 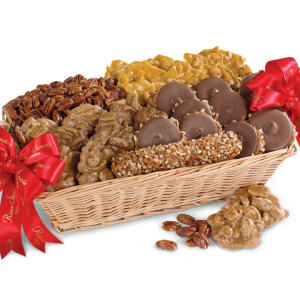 We'll create a customized gift card with your company logo and a personal greeting to accompany any gift selection, from a gift box of classic Southern Pecan Divinity to a Savannah Sampler Gift Box brimming with pralines, milk chocolate bear claws, chocolate covered peanuts, glazed pecans, divinity, and peanut brittle. You'll never run out of unique food gift ideas when shopping River Street Sweets!